RJ45 pass-thru receptacle to 8 inch pre-terminated CAT5e cable inside. 24 AWG wires in pre-terminated CAT5e cable. Circular threaded coupling mounts case side to connect with cable side connector. 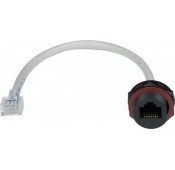 CAT5e shielded cable with a 6mm-7mm O.D. is required for waterproofing. Requires RJ45-5EWTP-CB cable side shield for complete connection. Weatherproof CAT5e Ethernet cable assemblies for use in harsh environments such as factories and other industrial applications.